Please state what you are measuring in (mm, inch etc). Are these measurements for inside or outside the window recess? We proudly use Louvolite Fabrics because of their durability and wide range of choice. 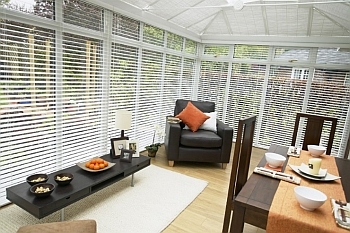 Venetian blinds offer a strong, bold look. These types of blinds feature horizontal slats which can be raised, lowered, and even tilted, giving you maximum control over how much light you want to let in as well as how much privacy you require. While they come in many different slat widths, the most popular is 25mm/1 inch. The great thing about venetian blinds is that you can choose between a traditional look and a modern style depending on which type of material you go for. If your home features elegant, old-fashioned styles of furniture and accessories, wooden venetian blinds will help to add to the traditional atmosphere (especially if you also have a lot of wooden furniture of the same type and shade), whereas aluminium venetian blinds will enhance a modern, contemporary-styled property. They are also often colour coordinated, with corresponding rails and cords, so you can completely match everything up with your existing décor. Plastic and vinyl slats will also give you slightly different looks depending on which effect you desire. While not perhaps as easy to clean and maintain as simple roller blinds, venetian blinds can be dusted regularly (with wooden slats being treated with a wood cleaner every so often if you wish), so you can keep them clean during your regular dusting routine. Due to the materials used to make them, both wooden and aluminium venetian blinds are extremely durable, so they’ll last for a long time without needing to be replaced. 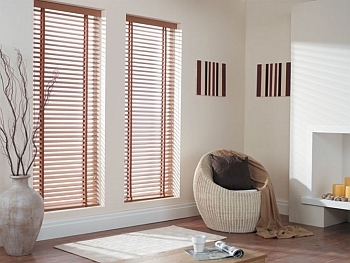 Venetian blinds are easy to install and incredibly easy to operate, making them practical as well as attractive, and the way the horizontal slats are formed give you several options as to how to use them. For example, the slats can be tilted in a way that stops passers-by from looking in, while still allowing you to see out if you wish (and letting some light in, of course). This makes this type of blind perfect for a home office – especially if you live on a busy road – where you can stop unwanted light from hitting monitors and computer screens and retain your privacy at the same time. Aluminium venetian blinds are often used in office spaces due to their contemporary look and their durability, so no matter what type of room or window you need treating, venetian blinds offer you a wide range of choices.